← Chasewater Transport Show – Next Weekend! Yesterday, whilst out riding around Staffordshire and South Derbyshire, I tweeted a photo that’s caused some curiosity. I thought I’d explain it, because some people seem quite unnerved by it. Superhero? Cruelty? No, just a fly mask... Grangewood, Derbyshire, 2:46pm, Saturday 9th April 2011. This horse isn’t blindfolded, and can see and hear perfectly well. 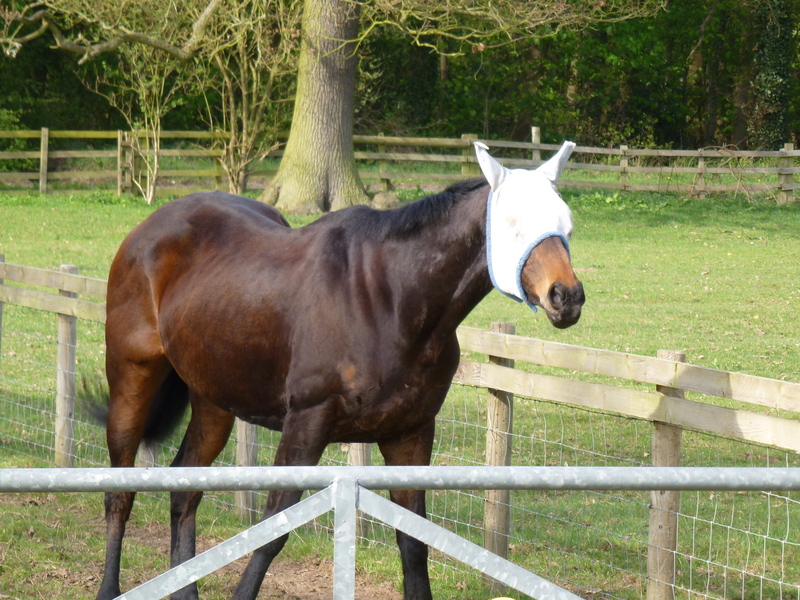 He’s been fitted with a flymask by his owner to stop the irritation from flies, bugs and mosquitoes that drive grazing horses mad and spread disease and infection. They’re not a universal thing but their use seem to be more and more prevalent. The mask is acoustically and visually nearly transparent to the equine who can potter about the paddock untroubled by insects. I hope that clears it up for the people who messaged me with some concern for dobbin’s welfare. This entry was posted in Environment, Events, Followups, Fun stuff to see and do, Interesting photos, Panoramio photo discussions, Panoramio updates, Reader enquiries, Shared media, Social Media, Wildlife and tagged #30daysofbiking, Cycle rides, Equine, Flymask, Grangewood, Horse, New Photos, Panoramio, Twitter, Wildlife. Bookmark the permalink. Use them a lot over here in Australia, where flies are the national bird!